Terry Mitchell (J.D. ‘83) doesn’t want to talk about the woeful realities of modern city living, like stark landscapes and excessive traffic snarls. He would rather talk about his vision of what cities can be — communities with people who are mindful of their environment and their neighbors, with short commutes and all the perks an urban habitat can offer. To Mitchell, it’s not a tall tale; it’s his life’s work. Mitchell is not your everyday real estate developer. He set out to be an architect, but instead became a banker and a lawyer. He earned business degrees from the University of Texas and St. Edward’s University before completing his law degree at the St. Mary’s University School of Law. He sees himself as a “student of architecture” drawn to beautiful and efficient design, but he credits his banking, real estate and law backgrounds for his success. 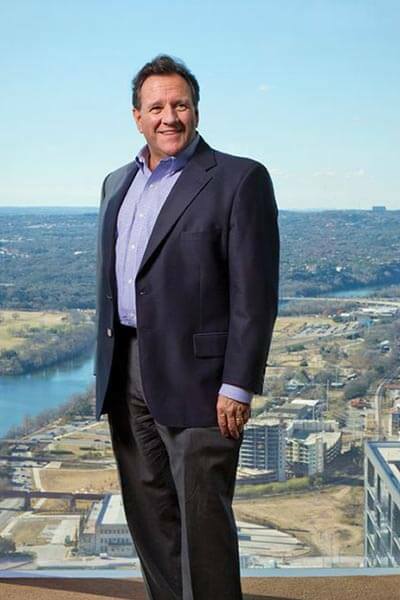 In 2003, Mitchell started Momark Development and began living his dream of revitalizing Austin and central Texas, one neighborhood at a time. He is passionate about neighborhoods with a broad range of housing options (from large family homes to smaller spaces for young singles or empty-nesters) and about how a well-functioning sense of community affects quality of life. He also theorizes that by making urban home ownership affordable, he can place people back in the heart of the city, which will revitalize the city, improve quality of living and — a boon to everyone — reduce traffic. “Creating huge housing developments on the outskirts of cities naturally causes terrible traffic problems. We need to move the workforce closer to their jobs,” he said. Many of Mitchell’s projects concentrate on just that — moving the workforce back into the city. This includes building what he calls “vertical communities” with common green space and lower prices than what is generally offered in cities. Austin, which Mitchell calls home, is known for its high housing costs. The awe-inspiring view is nice, but it is just one of the unique draws to a project. Mitchell carefully researches and considers specific needs of each location and the groups he is serving. He judiciously plans everything from the flow of the neighborhood to unique features like a common backyard on one floor and a gym on another. He wisely uses the environment to provide more green space.